A winger–forward from Kyneton who worked his way through to senior selection from Carlton Under-19’s, Billy Arch was a loyal servant of the Blues for five seasons from 1958 to 1962. Tall for a winger and strongly-built, Arch loved to run forward and have a ping at the big sticks. He kicked two goals on debut against North Melbourne in round 2, 1958, but from then on, faced daunting opposition from the likes of Laurie Kerr, John Chick, Graham Gilchrist and Chris Pavlou for a regular place in the Carlton side. Although he was never solidly entrenched in the team, Arch regularly stepped up when needed. His best year was 1961, when he wore his number 21 guernsey on to the field in 12 matches, kicked three goals, and forged a good understanding with centreman Berkley Cox. Arch had his one and only taste of finals football in 1959, playing at half-forward in Carlton’s shattering Semi Final defeat by Melbourne. 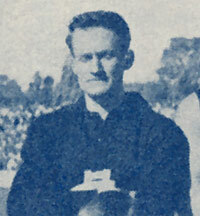 The Blues dropped out of contention after that, and didn’t return to September action until 1962 – the year that Arch finished up, after a particularly painful defeat by Collingwood at Victoria Park in early May. Contributors to this page: pblue , Bombasheldon , PatsFitztrick , molsey , tmd1 , keogh , Jarusa , true_blue24 , Juzz and admin . Page last modified on Sunday 29 of April, 2012 01:04:40 AEST by pblue. 1987 - Mark Maclure to make a comeback (29/04/87). 1987 Vic Rep's - David Glascott & Paul Meldrum.